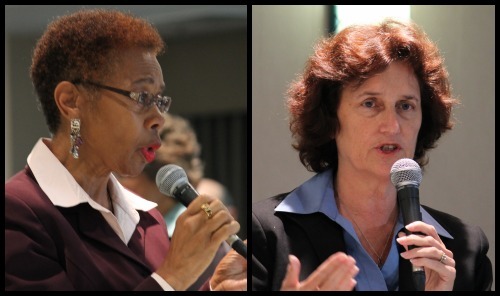 ELECTION ’12//OAKLAND CITY ATTORNEY | Oakland Councilwoman Jane Brunner recently sent scathing emails to voters attacking City Attorney Barbara Parker and accusing her of accepting campaign donations from attorneys at law firms currently receiving contracts from the City of Oakland. Brunner also accuses her opponent for the city attorney race of “pay-to-play” politics, which Parker denies. Brunner’s emails recite campaign rhetoric recently espoused at two previous city attorney forums concerning the expensive financial expenditures used to contract out legal work to outside attorneys. Brunner considers these costs to be an example of bureaucratic mishandling of funds. The councilwoman also described the financial disclosures as an exposé. “Now we see the very attorneys who benefited greatly from these contracts and these settlements contributing to the election campaign of the appointed city attorney. For too long attorneys and outside law firms have looked to Oakland as a cash cow – an easy mark for contracts and settlements,” said Brunner in the email. Posted in Barbara Parker, campaign finance, city attorney, Oakland. Bookmark the permalink. I'm sorry, if there were such misdeeds going on in the City Attorney’s Office then Brunner should have made it a major issue long before she was in the final 60 days of campaigning. I saw Brunner in my neighborhood a couple weeks ago. Talk about a tired politician who hasn't had a fresh idea in 10 years. Seriously, in person she comes off like a tired old dish towel thats been kept for about 7 years too long. Tired, frayed, stained, and limp. A no vote on that person staying in a city government. First of all, both the California State Bar, in other words the totally corrupt organization of backroom fixers that pretends to enforce standards for Califonia's lawyers, and also the legal profession itself repeatedly tell us that most lawyers are honest, so therefore it is obviously absurd that people as “honest” as lawyers could possibly be involved in a game of paying lightly disguised bribes in exchange for favors and/or contracts. And besides the fact that the CSB repeatedly informs us that it holds lawyers to the very highest and strictest standards, and out of its supposed desire to protect the public, and which it also insists is its primary mission, it also pretends that it will not even issue a law license to any applicant who has not supposedly first proven, and by way of a supposedly very thorough background check, to have the very highest moral and ethical standards. And for anybody who still is not convinced of the great integrity, intelligence, honesty, and extremely high ethical standards of lawyers, then just think of Richard Nixon, Spiro Agnew, Rod Blagojevich, Nadia Lockyer, Bill Clinton, and John Edwards. Matier & Ross's column of this morning, Monday, September 17, 2012 discusses the fact that Barbara Parker, and whose job as the head City Attorney for Oakland largely consists of defending the city of Oakland from lawsuits, solicited and accepted an election campaign contribution from private attorney John Burris, and whose business largely consists of suing the city of Oakland. While I had never even heard of Barbara Parker until reading this particular article of September 13, 2012 in the East Bay Citizen, however the fact that she would solicit, or even accept even if it had been unsolicited, an election campaign contribution from someone who is theoretically her opponent in lawsuits would seem to indicate that she has the same “standards” as most of the other members of that sleazy mafia which likes to refer to itself as the legal profession. In fact some years ago the mayor of a Peninsula city told me that when he was running for mayor PG & E offered him an election campaign contribution, and that he refused to accept it since he considered it to be nothing but a lightly disguised bribe. And I wish that Barbara Parker and also all other people running for election would also decline to accept so called “legitimate” election campaign contributions from sources who have every reason to offer bribes, and even if those bribes have been declared “legal” by the crooks in our totally bought and paid for state legislature. Including in regard to my post of earlier this today, to refresh my memory therefore a few minutes ago I looked up Barbara Parker's profile on the California State Bar's website. According to her record with the CSB, she is a graduate of Harvard University's Law School. And that does not surprise me, since I have found that Harvard and Stanford are tied in the contest to see which institution of higher “education” can produce among all of its graduates the very highest percentage who are extremely sleazy lawyers or businessmen, and with NYU in third place in the competition to have the very highest percentage of graduates who are world class sleazeballs, scumbags, parasites, and pathological liars. And as far as her position that her decision to accept an election campaign contribution from Burris was legal, even if it was legal, still even virtually any high school dropout, and unless the high school dropout was afflicted by extreme mental retardation, would realize it was extremely improper and as sleazy as could be. And while some lawyers would insist that Parker accepting an election campaign contribution from Burris was legal, proper, and ethical, that just further illustrates that the so called legal profession is many times less dedicated to fact finding, ethics, and proper procedure than it is to being a cesspool of fraud, backroom fixes, professional pathological liars with law licenses, and back scratching and favor swappng among the powerful and politically connected. To sum up, most lawyers care little or nothing about truth and justice but only about perpetuating: one, the self protecting mafia that makes many of them extremely wealthy; and two, keeping the game going in which the sleazier and more corrupt a lawyer is the more money he or she makes. For example, just think of John Edwards and Fred Baron.